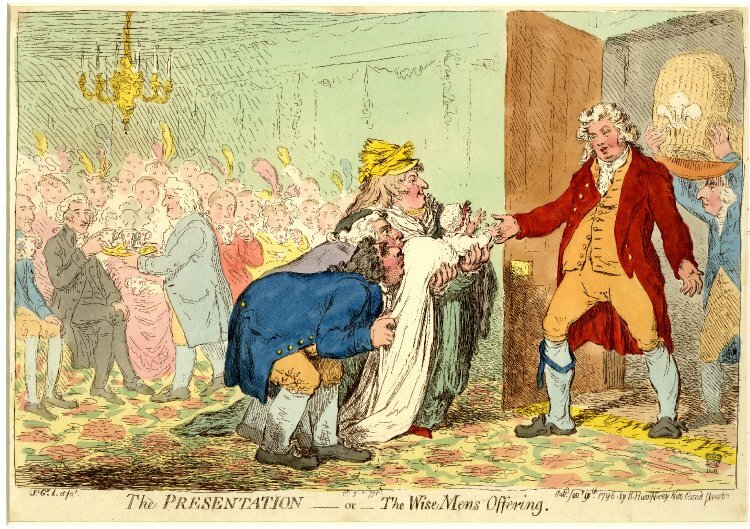 The Presentation – or – The Wise Mens Offering may not have been among James Gillray’s more memorable caricatures but it was perhaps one of his most controversial. 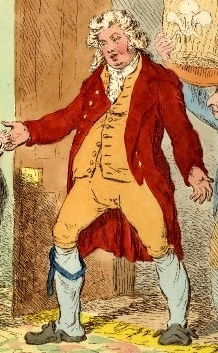 Of the hundreds of satirical images that Gillray produced in his lifetime, it is said to have been this print more than any other that brought him closest to being prosecuted on a charge of blasphemous libel. It seems that the church authorities took particular exception to Gillray’s use of a scriptural reference to the birth of Our Lord as the title for an image of an infant having its backside kissed and planned to haul the caricaturist in front of an ecclesiastical court to answer for his crimes. In fact the print was never intended to be a satire on religion, but rather an attack upon the political alliance between the Prince of Wales and the coterie of Whig MPs that clustered around Charles James Fox. It was an arrangement which dated back the Regency Crisis of the late 1780s, when the Prince and the Whigs had come together in an attempt to drive a bill through Parliament which would have made George king in all but name and put Fox in office as his new Prime Minister. The attempted power-grab ultimately ended in failure but the two men remained close allies and fast friends in the years that followed, giving rise to a ridiculous situation in which the aristocratic Prince George flirted with the notion that he was a liberal reformer, and the self-styled ‘friends of the people’ were using their votes in Parliament to defend the prerogatives of a prince whose profligacy with the public purse was legendary. The print was published on 9th January 1796, two days after news of the arrival of George’s newborn daughter had provoked a slew of fawning tributes from the Whig benches in the Commons. Gillray imagines a fantastically comical scene in which the Whig party has assembled in a reception room at Carleton House in order to prostrate themselves before the new princess and the disgustingly louche figure of her father. George comes crashing into the image from a door on the right, his arms thrown open in a gesture of greeting and his dress in an extreme state of disarray, a convention commonly used to suggest either intoxication or the recent interruption of some illicit tryst. A stout midwife stands before him holding the little Princess Charlotte, whose backside is being presented to be kissed by the grovelling figures of Charles James Fox and Richard Brinsley Sheridan. The loosely sketched forms of their colleagues can be seen in the background, sipping tea and patiently waiting their turn to offer similar congratulations to the future king. Public Office, Bow Street. Before W. Addington, Esq. 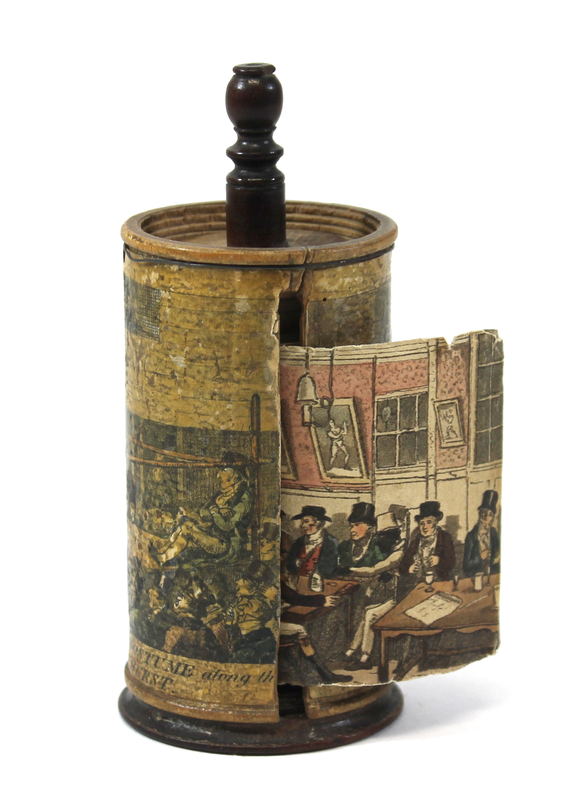 Mr Fores, the proprietor of a print-shop in Piccadilly, was on Friday taken into custody, on a warrant issued against him by the above magistrate, wherein he stands charged with contemptuously and impiously exposing to public sale a certain print, entitled, “The Presentation, or the Wise Mens Offering,” which is considered… as a burlesque on the scripture picture of the Wise Mens Offering to our Saviour, but is supposed to relate to a recent event at Carleton House. 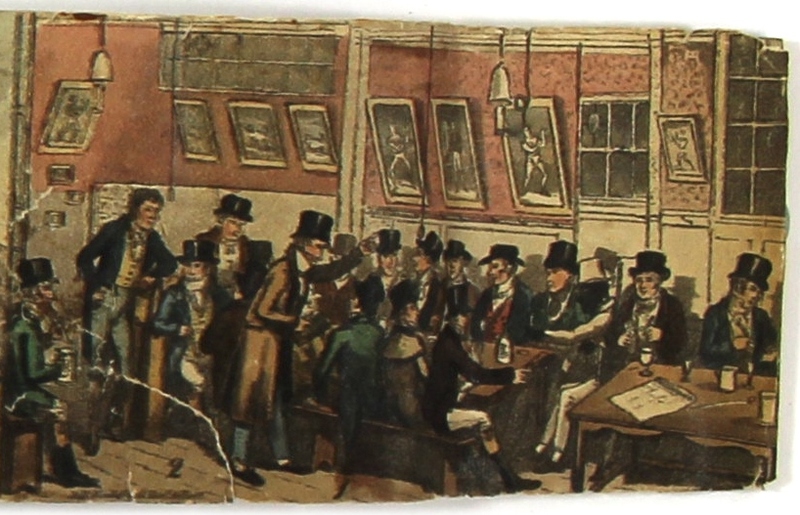 The offence being proved by the production of one of the prints, purchased at Mr Fores’ shop, he was ordered to find bail to answer the complaint at the next sessions for Westminster. Phillips, shopman to Mr Aitken, printseller in Castle Street, Leicester Fields, was accused of same offence, and also ordered to find bail for his appearance. 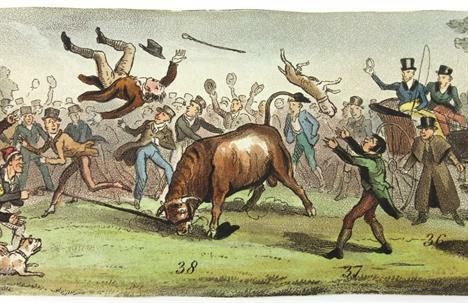 We don’t know whether Gillray was also involved in these events, or whether he or Landseer merely used them as a the basis of a story which was concocted to justify the taking of government money. What is perhaps more interesting from the point of view of this blog, is the questions this episode raises about the distribution and sale of Gillray’s works during this period. It is commonly assumed that by the time this print was published in 1796, Gillray was working exclusively for the printseller Hannah Humphrey and that her shop in 37 New Bond Street (later relocated to St James’s Street) was the only place in London from which one could purchase his prints. This source clearly contradicts that interpretation and indicates that while Humphrey may have monopolised the production of Gillray’s designs, she was still willing to sell quantities of finished prints to her rivals under wholesale terms that were generous enough to make it worth their while to sell the prints on. This arrangement must have continued until at least the middle of the following decade, because it is not until then that printsellers such as S.W. Fores began to employ lesser caricaturists to produce detailed copies of Gillray’s works. Finally, it seems somewhat unusual that Humphrey herself does not appear to have been implicated in these events. After all, the print in question carried her name and address in its publication line and we would therefore have assumed that the authorities would have struck at the source of the libel, rather than merely at those responsible for passing it on. 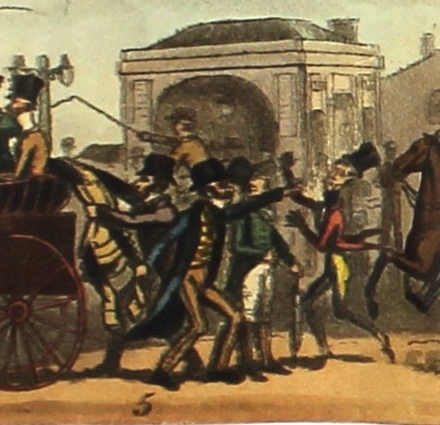 There may be two possible explanations for this: Firstly, that Humphrey was more discreet than her competitors and that as cases involving the prosecution of seditious or blasphemous libels often revolved around the issue of displaying such materials to the view of the ignorant and uneducated masses, she was not deemed to have been culpable in the crime. A second and far more speculative interpretation is that there may indeed have been some deal struck with the authorities to ensure that Gillray and his publisher were given immunity from prosecution, while the axe was left to fall on S.W. Fores and an unfortunate employee of James Aitken. 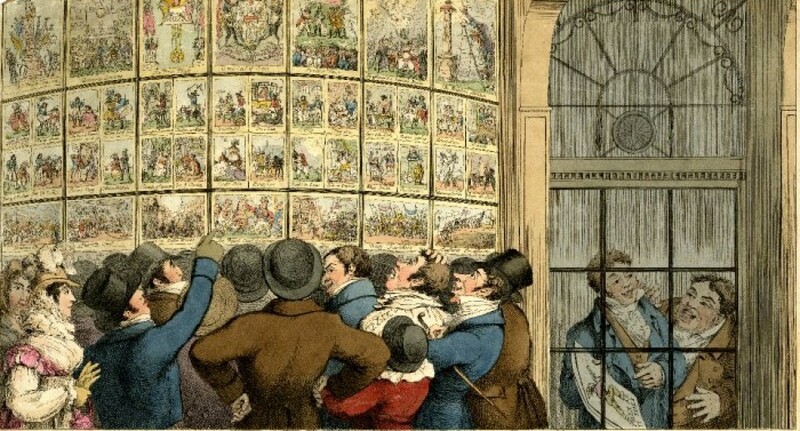 As with so much of the history that surrounds caricature prints, it is a puzzle which we will in all probability never be able to solve satisfactorily.